On 26 May, the pilot of a charter aircraft observed a heavy "boil" on the ocean surface over Esmeralda, feeding an elongate zone of discolored water. The pilot reported that he had not seen activity at Esmeralda in many years. On 4 June, L.G. Eldredge and the same pilot flew over Esmeralda, but saw no water movement or discoloration. Information Contacts: L. Eldredge, University of Guam. The Global Volcanism Program has no Weekly Reports available for Esmeralda Bank. One of only two known submerged volcanoes in the Mariana Islands is erupting west of Tinian. Unnamed and virtually unstudied, this volcano -- estimated to be 30-40 km W of Tinian's southern tip -- was first spotted on 26 April by crew members of Continental Air Micronesia who reported that its underwater explosions were causing a bubbling action on the water's surface. Steam vapor was also noted. The activity in the area has been irregular since then and several new eruptions were seen on 29 April. The surface of the water is marked by a series of boiling spots running north to south, with the southernmost fanning out in an open oval toward the SW for a distance estimated by pilots at about 3 km. Within this fan, the color of the water varies from light brown to greenish yellow. According to Dr. Eldredge, this submerged volcano has not yet been studied in great detail as far as he can determine. He believes that the last eruption took place 4-5 years ago. Dr. Eldredge is especially interested in any possible fish kills in the area. Other studies of such volcanoes have reported large amounts of dead fish floating on the surface of the water. This volcano is listed in the Catalogue of Active Volcanoes of the World as "Submarine Volcano Southwest of Saipan." It is a stratovolcano ... and its summit is 60 m below sea level. The height of the volcano above the ocean floor is about 1,000 m.
Information Contacts: L.G. Eldredge, Marine Laboratory, University of Guam. In April, "sulfur boil" activity was observed at the submarine volcano Esmeralda Bank from the U.S. National Marine Fisheries Service research vessel Townsend Cromwell. The sulfur emission can be seen as an area of strong mixing above the Bank on a 6 April bottom profile. The research vessel's log notes three sources of sulfur emission on 21 April, the strongest near a shoal at 50 m depth, a second S of a ridge just S of the main shoal, and the third in the saddle between these two shallow areas. The next day, the main source remained strongly active and emission continued from the saddle vent, but by 24 April sulfur emission was only barely visible. Further Reference. Gorshkov, A.P., Gavrilenko, G.M., Seliverstov, N.I., and Scripko, K.A., 1982, Geologic Structure and fumarolic activity of the Esmeralda submarine volcano, in Schmincke, H.-U., Baker, P.E., and Forjaz, V.H. (eds. ), Proceedings of the International Symposium on the Activity of Oceanic Volcanoes: Arquipélago, Serie Ciéncias da Natureza (Univ. Azores) no. 3, p. 271-298. Information Contacts: L. Eldredge, Univ. of Guam. The Global Volcanism Program has no synonyms or subfeatures listed for Esmeralda Bank. Esmeralda Bank is a massive submarine volcano with three summit cones oriented along a N-S line. Their summits are from 43 to 140 m beneath the sea surface. The highest, middle peak contains a 3-km-wide caldera open to the west and several parasitic cones. Frequent sulfur boils and water discoloration have been observed, which have variously been attributed to eruptive events or solfataric activity. Dixon T H, Stern R J, 1983. Petrology, chemistry, and isotopic composition of submarine volcanoes in the southern Mariana arc. Geol Soc Amer Bull, 94: 1159-1172. Gorshkov A P, Gavrilenko G M, Seliverstov N I, Scripko K A, 1982. Geologic structure and fumarolic activity of the Esmeralda submarine volcano. In: Schmincke H-U, Baker P E, Forjaz V H (eds) Proc Symp Activity Oceanic Volcanoes, Arquipelago, Revista Univ Dos Acores, 3: 271-298. Stern R J, Bibee L D, 1984. Esmeralda Bank: geochemistry of an active submarine volcano in the Mariana Island Arc. Contr Mineral Petr, 86: 159-169. There is no Deformation History data available for Esmeralda Bank. There is no Emissions History data available for Esmeralda Bank. 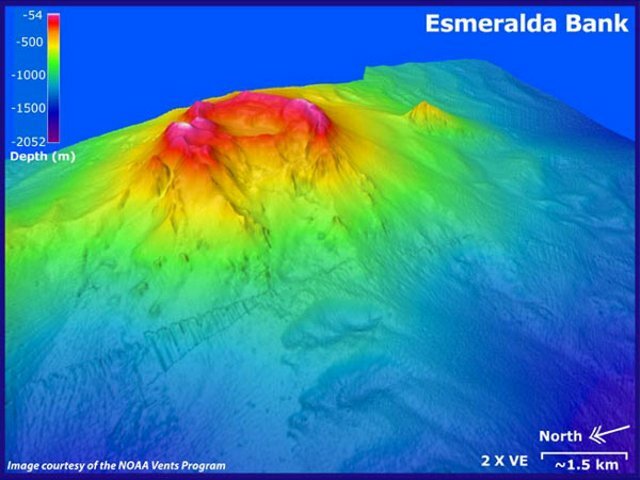 A bathymetric map with two time vertical exaggeration shows Esmeralda Bank submarine volcano, as seen from the NW. Depths in this image range from 54 to 2052 meters. Bathymetry data (~25 meter resolution) is overlaid on SeaBat data (~50 meter resolution) courtesy of Yoshihiko Tamura, JAMSTEC. Esmeraldo Bank is a massive submarine volcano with three summit cones, the middle of which is cut by a 3-km-wide caldera. Frequent sulfur boils and water discoloration from eruptive or solfataric activity have been observed. The Global Volcanism Program has no maps available for Esmeralda Bank. There are no samples for Esmeralda Bank in the Smithsonian's NMNH Department of Mineral Sciences Rock and Ore collection. Large Eruptions of Esmeralda Bank Information about large Quaternary eruptions (VEI >= 4) is cataloged in the Large Magnitude Explosive Volcanic Eruptions (LaMEVE) database of the Volcano Global Risk Identification and Analysis Project (VOGRIPA).